Robins are versatile in how they feed and can be seen using seed or suet feeders, however, more often than not you’ll see a Robin looking for food on the ground. Using a specialist Ground and Table Mix or feeding Live or Dried Mealworms is a good way to attract Robins. Robins are territorial – most gardens will have at least one. They don’t always like to spend time in eachothers company so if you have more than one and you’re using a ground feeding seed mix or mealworms, try and spread it out on the ground so the Robins wont have to get too close to each other. Plenty of shrubs for cover will give Robins shelter and natural food. With patience you can get a Robin very tame using Mealworms! Stand near the spots you usually see your Robins and eventually one may land on your hand. This can take a few attempts but is worth the effort! Robins will also take Suet Pellets and Straight Seeds from a bird table, especially those with a high content of fruit or insects. Robins can be attracted to breed with open-front nestboxes. Robins also like to nest in outbuildings and wooden sheds – please make sure access is not stopped if they start using them. If you are lucky and your Robins breed – baby Robins are brown and speckled, without a red breast. 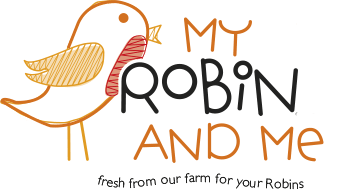 Try our My Robin and Me Bird Seed Mix – designed with Robins in mind and packed with seeds, fruits and mealworms.